We have been trained so well to associate the light bulb with insight and creative thinking that simply sitting under one can inspire, well, insight and creative thinking. That’s the conclusion researchers at Tufts University came up with after putting students through a series of experiments under both a bare incandescent 25-watt light bulb and an overhead fluorescent light. 25-watt light bulb and an overhead fluorescent light. insight than other words–possibly indicating that they associated light bulbs with insight. Seventy-nine college students were given three minutes to solve a problem where they had to connect four dots arranged in a square by drawing three connected straight lines. They were not allowed to either lift the pencil from the page or retrace a line, and had to end the drawing at the same dot it began with. (This involves drawing a triangle.) 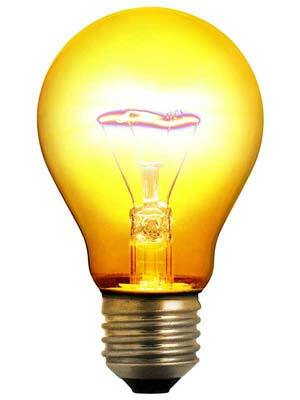 Volunteers exposed to the light bulb solved the problem twice as often as ones given the fluorescent light. Thirty-eight college students were given sets of three words and told to come up with another word that could form a compound with all three. For instance, a triad of words might consist of “print,” “berry,” and “bird,” with the answer being, “blue.” The light bulb led volunteers to solve 70 percent more triads correctly. bulb. As expected, the results were the same. The lesson: Surround yourself with symbols of insight if you want to work smarter. If that means sitting under a bare light bulb while your coworkers question your sanity, so be it.